It's important to check your RV electrical system from time to time and especially when you take it out of storage. Checking your RV electrical system should be on top of your RV checklist. RV fires are not uncommon, and once started almost certainly will consume your RV. Since this can happen while you're inside your RV, and even while traveling down the road, make your electrical system one of the first inspections on your list. If you stored your RV in below-freezing temperatures, the cables can be affected by expansion and contraction as temperatures fluctuate. If stored in hot weather, the heat can speed up the breakdown of coatings and connections. If you have a trailer or fifth wheel you'll have both a 12-volt DC battery powered system and a 120-volt AC electrical system like the one that powers your house. If you drive a motorhome, you'll have a separate 12-volt DC system for the vehicle's automotive system. Basically, your plug-in outlets, refrigerator, air conditioner, microwave oven, and larger appliances are powered by AC. Some, like your refrigerator, are powered by multiple systems under different circumstances. A three-way refrigerator has switches to power it by a 12-volt battery or by propane. Your circuit breaker is the safety switch for power surges coming through the AC system. Make sure you know where your circuit breakers are located. You can mark your circuit breaker, as you do at home, to indicate which breaker controls which appliances and outlets in your RV. Fans for the stove, furnace or vents, water pumps, overhead lights, radio, and just about everything else are powered by the DC system. Fuses like those used in cars are used for shutting off power to these electrical circuits. Make sure you know where your fuses are located. 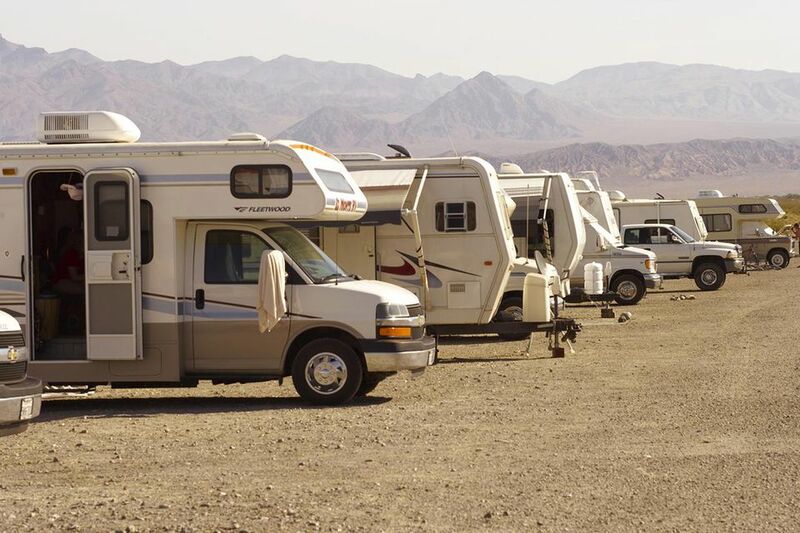 RV parks and campgrounds don't always maintain their hookups in pristine condition. They are used by different people repeatedly during any given season. People aren't always careful how they handle equipment and may cause or contribute to damage. Time, weather, exposure, and use wear things out, and RV hookups get plenty of all that. To protect your electrical system, purchase an external power surge protector to plug directly into the RV park power source. This is basically a circuit breaker between your system and theirs, but with some additional protection. Not only will it shut the power off when it spikes, but also when it dips. Power dips can cause wiring to get hot and can burn out your appliances. Your internal circuit breaker won't protect you from power dips. Electrical cords: Start your electrical inspection with the heavy duty electrical cord that connects your RV to the park power source. Do you have 20, 30, or 50 amp power? Does the park you plan to stay at offer the amps you need? If you have a 30 amp system, make sure you have a step-down cord to convert from 50 amps to 30 amps. Check the cords for damage, cracks, cuts, and breaks where the plug connects to the cord, crumbling or a sticky feeling indicate serious wear. Replace the cord if you see signs of age or damage. Are the plug's prongs intact and secure, or do any of them wiggle? Are they bent? Is the ground prong intact? Circuit breakers and fuse boxes: Check your circuit breakers and fuses. Are they marked to indicate what they control? Do you have a replacement breaker or fuse? Is the circuit or fuse box clean and safe or showing signs of corrosion or deterioration? Are all the fuses and breakers working? Flip the circuit breakers off and on. Batteries: Check RV battery fluid levels. Fill with distilled water. Check for corrosion, battery acid, expiration dates. If battery acid is on the terminals, you can clean this with a brush and a solution of baking soda and water. Wear protective eyewear and old clothes. Battery acid will splash and can burn your eyes and skin and burn holes in your clothing. One method is to place a plastic bag over the terminals and keep them covered while brushing them. Learn the difference between standard batteries and deep cycle batteries. Appliances: Check each appliance for normal operation. Do lights work in the refrigerator and microwave? Can you switch your refrigerator from AC to DC to propane? Check behind the refrigerator for proper ventilation. Clean dust and spider webs away. Is the fan working? Is the propane igniter clean? Check especially for mud wasp nests. Mud wasps are attracted to the smell of propane and often build nests nearby. Check the same for the furnace ignition system. Test all the lights and outlets inside your RV. Test your propane tank level indicators and any other indicators your RV has. These are usually on the stove hood. Does your air conditioner work properly? Are the filters clean? Does your furnace work properly? Do all of your outside brake lights and marker lights work? Do brakes and all other electrical connections between the tow and towed vehicles work properly? Check to be sure you hear the brake drum magnets click when you apply the brakes. Line voltage: Purchase and use a line voltage meter or voltage gauge and a polarity tester. These are inexpensive and can warn you before any damage takes place. Use the polarity tester to check the shore power before you plug into it. The polarity tester has a light system that will tell you if the shore power is wired correctly. If it's not, request to move to another site. Once plugged in check from one of your inside outlets to be sure the line voltage is in the safe zone, between 105 volts and 130 volts. A 3-pronged voltmeter can be left in an outlet for continuous monitoring and a reminder that this is worth checking frequently. Be prepared with candles, lanterns, or flashlights. On a moonless night, it can be nearly impossible to do any sort of repair inside or outside without one of these. Along with extra fuses and circuit breakers as replacements a surge protector may save your system from park electrical fluctuations. Don't think that because your 30 amp RV is hooked to a 50 amp power source, that you can run every appliance at once. You are still limited to 30 amps.